How many fluids on winter bike ride? So I created a video to answer the question! How many fluids do I need riding my bike? Click here to see the video on Facebook with comments . and I will do my best to answer it via video and then put it here in a blog post. Now to answer the question – How many fluids Do you need for winter riding? How many fluids to drink per hour can vary from person to person. I know for me, I went on a ride this past weekend on Saturday for 2 hours and temperatures were barely in the 30’s. I over-dressed and got a bit dehydrated as a result. My hamstring cramped as I was getting off the bike. Although I took 28 ounces with me, I only drank about 10 oz. if that. Lesson learned. But it is harder to drink when it is cold than when it is warm and sunny! Sunday I was out for and unplanned 3 hours, and again, only one 28 oz bottle but I did drink it all. But I really should have had more. I hadn’t planned on a 3 hour ride, so I ran out of energy during the last 30 minutes purely due to lack of fluids. Not a lack of fuel or food. Rule of thumb is to drink 16 oz per hour of fluids. This can be straight water (I prefer either taking electrolyte capsules before and during if I just take water), electrolyte solution or coconut water. There are many ways to get your fluids in, but you do have to drink the fluids in order for them to work. Having them in the bottle on your bike is not quite enough. You must drink your fluids. You can either stop every 30 minutes and drink if the cold is too much to grab the bottle while riding, and stop to refill every 90-120 minutes. If you plan a 2 hour ride, you may be okay with just the one bottle. If longer than 2 hours, then you should really take a second bottle with you if you do not plan to stop – like I did on Sunday. 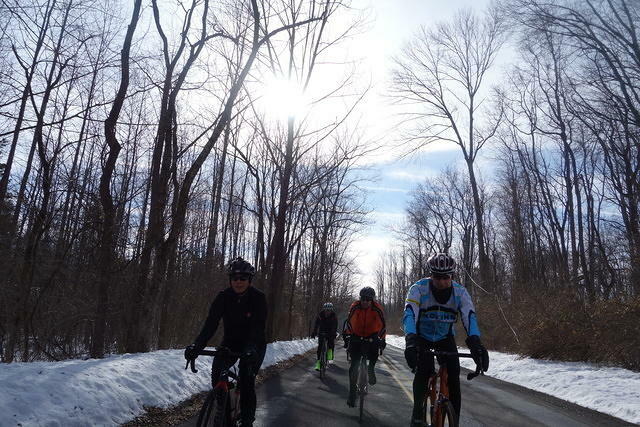 How many fluids should you drink on a winter bike ride? Probably more than you actually are! Shoot for 16 ounces per hour and definitely not less than that or you will cramp or run out of energy – both are signs of dehydration. Need to work on your hydration plan for a spring cycling event? Contact Joanna to schedule your Race Day Nutrition Strategy session today.